The Executive Assistant Manager of the Centara Duangtawan Hotel in Chiang Mai, Preeyanuch Yodtamee, together with the hotel’s Sales and Public Relations Team welcomed Prof.Dr.Anurak Panyanuwat; Director of Chiang Mai University’s University Academic Service Center (UNISERV) and his staff when they recently visited the hotel to carry out an inspection. Old, old friends in Chiang Mai celebrating Marji Around Town’s birthday. 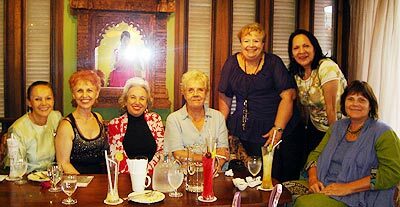 Celeste, Linda Galloway, Lily, Audrey, Margaret, Hope and Maria having fun at a Chiang Mai Tea House. 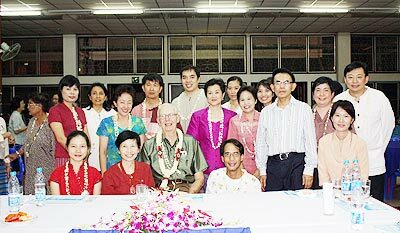 Khunying Sasima Srivikorn celebrates Birthday Dinner Bash in Lanna style. Family members and close friends led by Chalermbhand Srivikorn recently organised a lavish dinner party at the Mandarin Oriental Dhara Devi’s Jum Thong Hall in celebration of the 72nd birthday of Khunying Sasima Srivikorn. 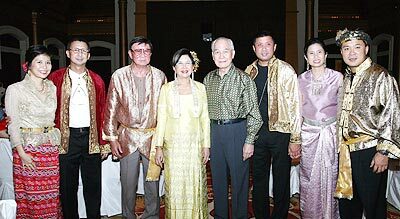 Chalermbhand and Khunying Sasima Srivikorn, (3rd and 4th left), welcomed their honoured guest, former Prime Minister Anand Panyarachun, (4th right), and all members of the Srivikorn family. Everyone at the party wore magnificent Lanna-style costumes. The Bangkok Election Commissioners’ chairman Aphichart Sukatkanont arrived in Chiang Mai city to prepare for and follow up the local mayoral election. He was warmly welcomed to his chosen hotel, the Royal Princess Chiang Mai, by its assistant general manager Kraiwit Niamsuwan. 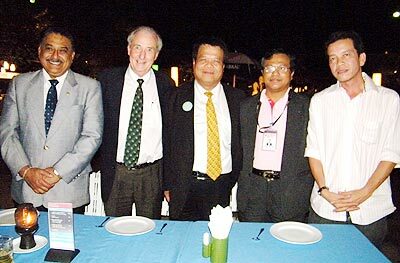 Getting together on October 1 for the opening of the Beer Garden at Imperial Mae Ping Hotel are from left, Pratheep (Peter) Malhotra , MD of the Chiang Mai Mail, Dr Iain Corness, Features Editor of the Pattaya Mail Media Group, Praphan Kodpetch, GM of the Imperial Mae Ping Hotel, Phitsanu Thepthong, Editor of Chiang Mai Mail and Nopniwat Krailert, special correspondent for the Mail. McCormick Hospital’s management hosted a welcoming party at the 95th Year Building on October 3 for Dr. John J. Guyer, the hospital’s former director, who retired in 1990. Hospital personnel and staff who had been Dr. John’s colleagues warmly welcomed his return for Home Coming Day.